Sometimes you will using the courier services like UPS,DHL,FedEx to ship some good that important or urgent.If you using appointed courier service,there are easy for you to track the good with log in the courier website with track no.How about using different courier services ? you will be annoying have to go each courier website to get the tracking information.Is there any solution for it ? 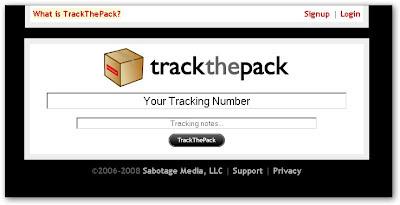 Trackthepack is a solution for you.Trackthepack is a cool website for tracking the goods from major courier services,you need to type in the track no and click the button,then they will get back all the good informations including the current status,estimated delivering date,final destination and current location. Moreover,if you sign up a account ,you can put all the tracking no. and saved it,then can get the track status without retype again the track no,you also can use features like Google map to show the location of the delivery good. Next time,try to use this cool website for tracking delivery package and compare with the courier website.